Floppy Drive: built-in Shugart 143 kB 5.25"
Here's another tidbit you might add: Rupert Lissner wrote a program for the Apple ///, called 3-EZ Pieces (I might be spelling it wrong). It combined spreadsheet, database, and word processing -- and was probably the first "works" program. Of course, like the Apple ///, it didn't sell well. 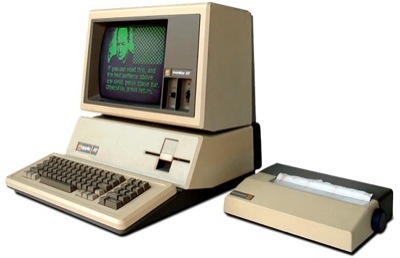 However, when the Apple ][e was introduced, so was a new version of Lissner's (come to think of it, I might be spelling his name wrong, too) software, as AppleWorks. It became the biggest-selling software package of all time, and Rupert became rich. He bought a red Ferrari and a vanity licence plate reading "MIO POMO" (my apple). 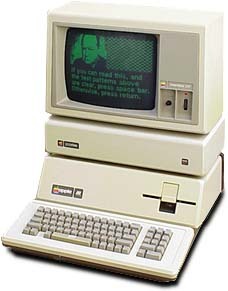 It's little known, but the Apple /// could do color graphics when connected to a color display. In that case, it could do 4-bit (16 colors) 40x48 and 140x192. One of the Apple ///'s many problems was its poor ventilation. The heat often caused the logic boards to warp, which resulted in the chips coming loose from the board. It is reported that when one called Apple to report this problem, they actually suggested you pick the computer up and drop it a few inches from the ground. Good old fashioned way of fixing things... nice to hear a story like that when nearly all tech help today is actually no help at all. The Apple /// problem that involved lifting the machine and dropping it was because the chips became loose during shipping. It was not a heat related problem. I worked at the Byte Shop in Seattle for the Terrells in 1980 doing sales. When we received our ///, it was an out of the box failure. When another salesman lifted the front of the machine and dropped it, it reseated the chips and the machine worked with no problem. I have never seen one with that problem because of heat issues. I even sold an Apple ///, that very day and the purchaser never reported a problem with the machine that was related to heat.